He grins at the check. My horse manages to save the king, but the game would probably be over in two moves. And that is predictable. He suddenly loses patience and pushes all my chess pieces with his pawn and declares himself the winner. Then, he jumps twice and runs away; typical of his eight years. That’s youth for you. I like this very much. Very clear and precise. The younger they are, the better they are at chess. Adults get bogged down with rules – in chess as in life. as an avid yet amateurish chess player i just love this! The impatience of youth. Such a delicious scene. I could just see him bounding away to do something else. So hard to loose, but once the lesson is learned…we can allow the eight year old his brief glee and muck running. Charming. I too agree with Penny that the haiku is a perfect fit. 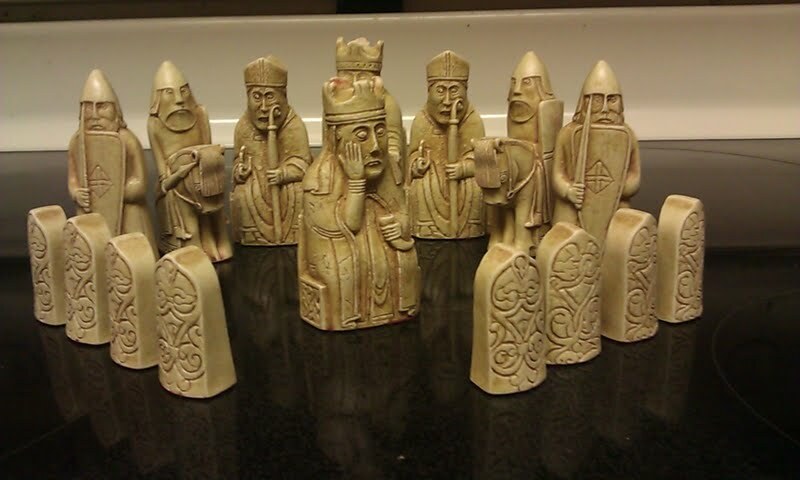 The picture of Isle of Lewis chess set made me click this story. An impulsive boy who doesn’t want to lose might become a chess master someday. Your right. Just like what happened to me. I remember as a young boy, I dreamed of becoming a future chess master like Bobby Fischer. Oh. something similar to the boy here?